Université de Versailles Saint-Quentin-en-Yvelines (UVSQ) is the largest center for higher education, research and technology close to Paris area. 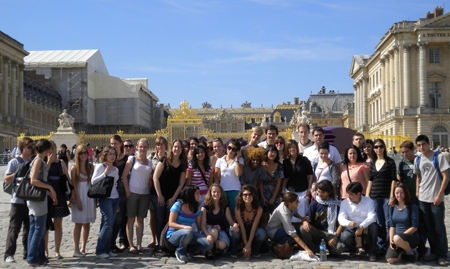 UVSQ welcomes international students interested in studying in France for a semester, an academic year, or the full duration of a degree program. Across four main disciplinary fields, discover our undergraduate programs. As a member of Université Paris-Saclay, UVSQ provides a master's level education program backed by research of the highest international level. Université Paris-Saclay and its members will implement a broad exemption policy for non-EU students and PhD students, by bringing tuition fees into line with those of EU students and PhD students. The excellence of UVSQ as a research university is assured by its 39 laboratories and research institutions and is locally, nationally and internationally recognized as a source of expertise and resources. Choosing to study at UVSQ means choosing a university on a human scale. Joining UVSQ, you will have the opportunity to enjoy a campus life full of energy. As a founding member of the Université Paris-Saclay, UVSQ offers attractive and internationally recognized master’s level education programs backed by high-level research.